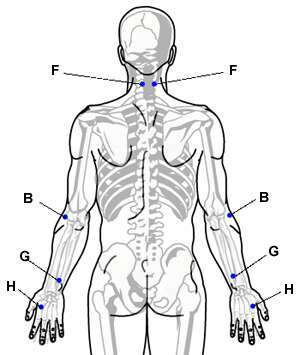 There are the acupressure points for relieving allergies. Working on these points can help you get better quicker. You do not have to use all of these points. Using just one or two of them whenever you have a free hand can be effective. Location: In the hollow below the collarbone next to the breastbone. Benefits: Relieves allergies associated with chest congestion, breathing difficulties, asthma, coughing, and sore throats. Location: On the top, outer end of the elbow crease. Benefits: Relieves allergies, particularly inflamed skin disorders (such as hives and rashes), itching, and fevers. Location: Two finger widths directly below the belly button. Benefits: Relieves allergies that accompany constipation, gas, fatigue, general weakness, and insomnia. 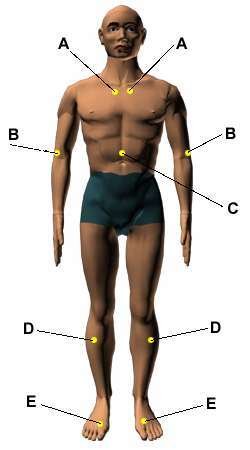 Location: Four finger widths below the kneecap on the outside of the leg. Benefits: Strengthens the whole body to prevent as well as relieve allergies. Location: On the top of the foot in the valley between the big toe and the second toe. Benefits: Relieves all kinds of allergic reactions, especially bloodshot eyes and neuromuscular disorders. Location: One-half inch below the base of the skull, on the ropy muscles one-half inch outward from either side of the spine. Benefits: Relieves allergic reactions such as exhaustion, headache, and swollen eyes. Location: On the top of the forearm between the two armbones, two and one-half finger widths above the wrist crease. Benefits: Relieves allergic reactions by strengthening the immune system. Caution: This point is forbidden for pregnant women unless they are in labor because its stimulation can cause premature contractions in the uterus. Location: In the webbing between your thumb and index finger. On the outside of the hand, find the highest spot of the muscle when the thumb and index fingers are brought close together. Benefits: Relieves all kinds of allergies, such as headaches, hay fever, sneezing, and itching.